These women are in jail not because they’ve been convicted of a crime but because they can’t pay to get back to their lives as they await trial. 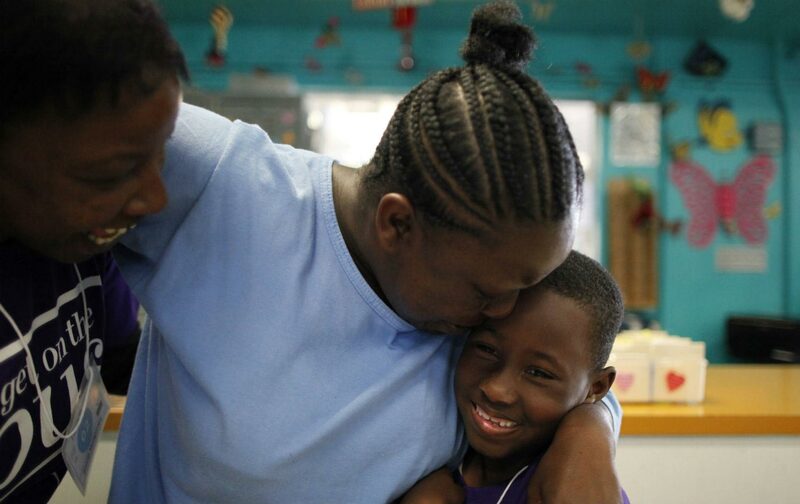 This week, black women in more than a dozen jails across the country will receive a Mother’s Day gift from the Black Lives Matter movement: their freedom. These women are among the 62 percent of people in jail who are there not because they’ve been convicted of a crime but because they can’t pay to get back to their lives as they await trial. Organizers with Southerners on New Ground (SONG), the Movement for Black Lives, ColorOfChange, and other groups have reached their goal of raising more than $250,000 for what they’re calling National Mama’s Bail Out Day, and are continuing to raise more. These groups will pay for the release of women whose pretrial detention illustrates much of what’s wrong with the criminal justice system. Many of the women who will be freed are in jail for low-level offenses such as loitering or small-scale drug possession. Nationwide, nearly a third of all women in jail have serious mental health issues, and the racial disparity is clear: Black women make up 44 percent of women in jails. The idea for the Mother’s Day bailout, which will free at least 30 women in Atlanta, Houston, Minneapolis, Los Angeles, and other cities nationwide, came out of a January gathering of representatives from 25 black-led organizations that wanted to collaborate on bail reform. The groups wondered how they might begin to put into action the vision outlined in the Movement for Black Lives policy platform released last summer. Mary Hooks, co-director of the Atlanta-based LGBTQ organizing project SONG, offered an idea she’d been developing with other activists who had noticed the disparate impact that money bail and jail-related fines and fees has on LGBTQ communities. Hooks’s campaign idea—what she describes as “using our collective resources to buy each others’ freedom”—was welcomed by the larger group. And because event organizers emphasize the ways race, class, and gender identity all play a role in criminalization, they have an expansive understanding of who qualifies as a mother. “When we talk about black mamas, we know that mothering happens in a variety of ways,” Hooks said. “Whether it’s the mothers in the clubs who teach the young kids how to vogue, or the church mothers who took care of me.” Women who are birth mothers and chosen mothers are eligible to be bailed out. Mother’s Day, with its idealized notions of family and womanhood, is the right moment to force an examination of women in jails, said Arissa Hall, a national Mama’s Bail Out Day organizer and project manager at the Brooklyn Community Bail Fund. “All mothers are not celebrated,” she said, adding that this is especially true of women who struggle with poverty, addiction, and mental-health issues—in other words, the women who fill our jails. “Black moms especially have not been granted that title of motherhood,” she added, going on to describe how slavery shredded kinship bonds. Black women, too, she noted, have historically taken on caretaker roles that have put them in charge of other people’s children and away from their own. This is the work bail funds across the country engage in every day, which is why Hall’s expertise has been critical. She’s been researching the specifics of how bail operates in the cities and counties where this week’s actions will take place, building relationships with sympathetic public defenders and otherwise demystifying the process for organizers. “It’s a myth that folks don’t come back to court” when released on their own recognizance, she told me, explaining that upwards of 95 percent of people helped by bail funds return to court for their scheduled appearances. “People will come back to court regardless of whether or not bail is set.” In her experience, what it takes to get people to their court dates is phone-call reminders and bus or train fare. Providing the social services people need can help, too, which is why in Atlanta there will be a homecoming celebration on Mother’s Day where the women bailed out of Fulton County and Atlanta city jails can gather for a barbecue and more information about subsequent campaigns to end cash bail, Hooks said. In addition to learning about the national effort they’re a part of, the women will be able to have photos with their families taken and get access to resources for housing, jobs, health services, and rides back to court.